When, in 1979, John Cunliffe sat in his back bedroom to write about an affable country postman called Pat, Postman Pat toys were probably the last thing on his mind. 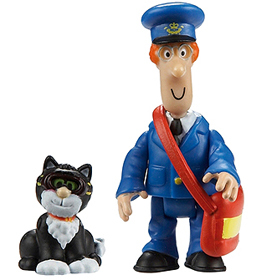 Today Pat is without doubt the most famous postman in the world and the famous toys inspired by the Greendale Postman are delivered to countries all over the world. Back in 1981 when the instantly treasured first 13 episodes of Postman Pat were aired on the BBC the possibilities for licensed Postman Pat merchandise were still barely thought of. But through the 80’s puppet master Ivor Wood, via his Woodland Animations company licensed literally hundreds of Postman Pat toys, figures and games. By the early 1990’s Entertainment Rights were helping to turn Postman Pat into a global licensing phenomenon. And today new licensee Character Options promise to take Postman Pat toys to a whole new level of sophistication. Some of the vintage Postman Pat toys from the early 80’s are becoming highly collectable. Postman Pat figures by US toymaker ERTL and the long-forgotten UK toy companies Bendy Toys and Barons Manufacturing Ltd can only become ever harder to find, especially in mint condition. Today, though Pat may have lost his long association with the Royal Mail, he now has a new employer in the Special Delivery Service (SDS) and brand new licensee in Character Options. Character’s SDS Postman Pat toys are brilliantly designed modern collectables for a whole new generation of Postman Pat toy fans.